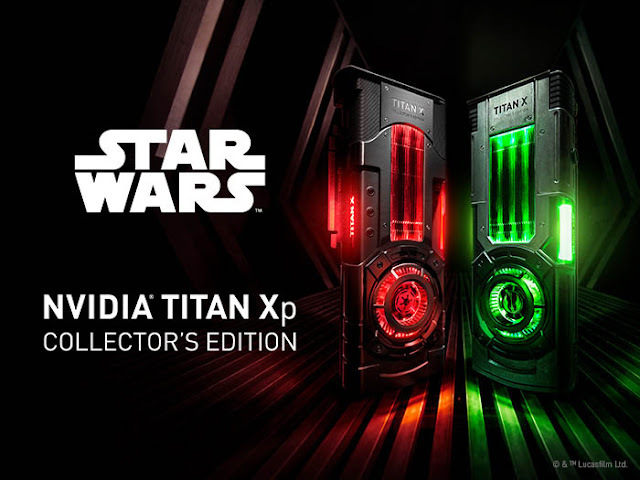 NVIDIA has announced two new collector’s edition NVIDIA TITAN Xp GPUs created for the ultimate Star Wars fan. The new Jedi Order™ and Galactic Empire™ editions of the NVIDIA TITAN Xp have been crafted to reflect the look and feel of the Star Wars galaxy. These new Star Wars collector’s edition GPUs pay homage to the light side/dark side dichotomy, and contain hints of the Star Wars galaxy, such as the hilt of Luke Skywalker’s lightsaber and light panels reminiscent of the Death Star. The Jedi Order GPU simulates the wear and tear and battle-worn finish of many items used by the Rebel Alliance, resulting from its diecast aluminum cover being subjected to an extensive, corrosive salt spray. Conversely, the Galactic Empire GPU’s finish features simple, clean lines, emulating the high-end, orderly nature of the resource-rich Empire.